HOUSTON, Texas - NASA's Spirit Mars rover has wrapped up exploration of a baffling feature called "Home Plate" but now faces the onset of martian winter while dealing with dropping power levels and fighting a balky right front wheel. "Our current focus is to drive like hell ... and try to get [Spirit] to safe winter havens before the power situation gets really bad," said Steve Squyres, lead Mars Rover Exploration scientist at Cornell University. Squyres and numbers of the Mars Exploration Rover team presented the latest findings from the robotic twosome--Spirit and Opportunity--at the 37th Lunar and Planetary Science Conference (LPSC) being held here throughout the week. "Home Plate has occupied most of our energy and attention for the last month or so," Squyres reported. "It is a spectacular plateau," he said, made up of several distinctive units, although the mineral makeup and geochemistry of the units are similar. During its surveying of the site, Spirit came across an important feature: a possible "bomb sag"--what looks like a volcanically-produced object that was blasted into the air. It then hit the ground deforming sets of parallel layers evident in Home Plate. "It's the only one of these that we have found ... I wish we could find more. We have been searching for more but so far, only found one," Squyres reported. Spirit is a bit worse from wear, in the sense that the robot's grinder teeth have worn out. The rover still makes use of its brush also mounted on the rover's outstretched mechanical arm. But what is Home Plate? "First a caveat," Squyres said. While the feature by itself is a fascinating structure, rover scientists do not know that it is an isolated instance of this material. "We have no idea yet how widespread Home Plate-like material may be," Squyres added. "We have not seen anything like this before, but it doesn't mean there isn't more stuff out there." So, is Home Plate impact or is it volcanic? "I'm leaving this one open for now," Squyres responded. The most compelling observation for volcanic origin of Home Plate, he said, is clearly associated with lots of nearby vesicular basaltic rocks. 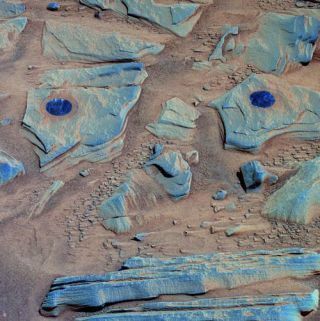 As Spirit approached Home Plate, it was observed that lots of vesicular basaltic rocks are also on top of the captivating feature, all having a composition that is very similar to that of Home Plate. That association, Squyres continued, favors a volcanic origin in his mind. "However, you've got to treat that as circumstantial evidence and both hypotheses at this point I consider open, pending future exploration," he said. Regarding Spirit's future agenda of exploration within Gusev crater, "we are now in a 'drive or die' situation," Squyres said. The robot's set of power-providing solar wings are dusty. Given the upcoming winter on Mars, with the Sun dropping low in the sky, ground controllers need to park Spirit onto north facing slopes. "We effectively sort of have to hibernate when we get into the depths of winter," Squyres said. Identifying prospective safe havens for Spirit is a task yet to be completed. "We're hoping within a week or two to be on a nice, toasty and warm north-facing slope that will enable us to survive yet another winter on Mars," Squyres concluded. Jim Rice, a Mars Exploration Rover Project science team member at Arizona State University in Tempe considers Home Plate to be a tuff ring/maar - a feature that points to hydrovolcanic explosion(s), he told SPACE.com. Rising magma below the martian surface encountered ground water or possibly ground ice, resulting in an explosive volcanic eruption. "I think we are seeing base surge deposits from this event," is the read on what Spirit has found, Rice said. "But we've still got more to do," Rice added, to nail that judgment to Home Plate. Like many on the Mars rover science team, Rice said he's going to be sad to see the rover's stilled on the red planet, akin to having a friend in the family die. While Spirit continues its work in Gusev crater, the Opportunity Mars rover plods along across the landscape of Meridiani Planum on the other side of the planet. It too must be positioned to survive the oncoming winter on Mars. "Every day is pure exploration...we have been fortunate to have this much," Rice said. "If both Spirit and Opportunity died tomorrow we couldn't complain. It would be really sad for a lot of us because we have been living with these machines for years now." Rice said the rovers have produced more than the science team dreamed possible. "But there's always going to be something else around the corner, around the bend you want to get."